Teachers nominated 27 students for performing good deeds throughout the year. 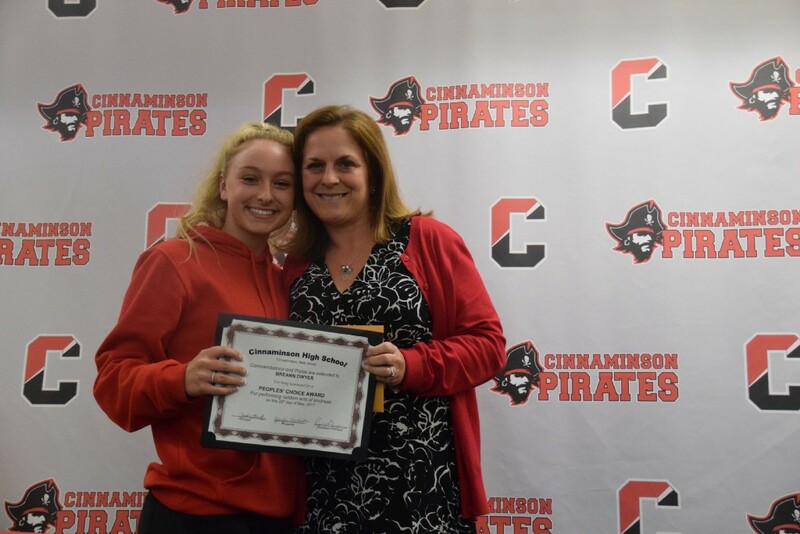 CHS science teacher Jennifer Alvarado presents Breann Dwyer with a People’s Choice Award. 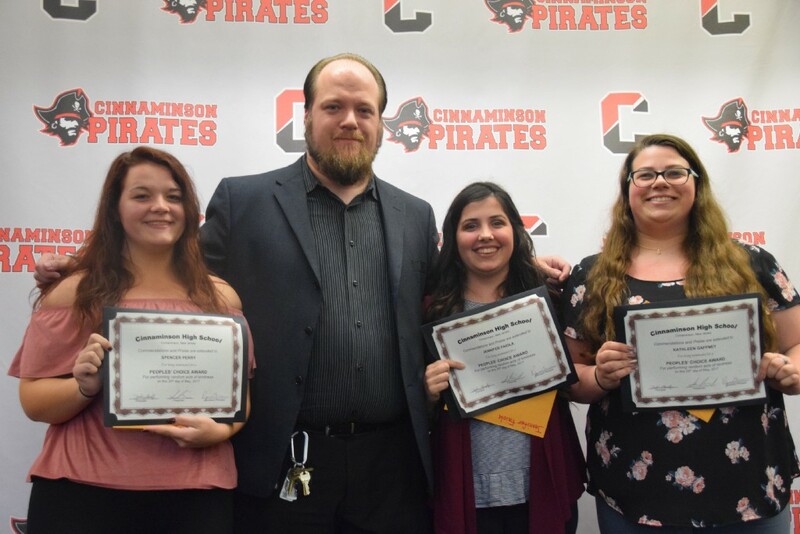 Cinnaminson High School each year honors students who have performed random acts of kindness or have given freely of their time to help someone without expectation of reward. This year, the school recognized 27 students nominated by various faculty members at its 18th annual People’s Choice Awards. In addition to recognizing good deeds, the program allows teachers to nominate students simply because they make their day a little brighter. More than 20 local businesses donated gift certificates to be awarded to the student nominees. Assistant Principal Ryan Gorman kicked off the event, which was held in the high school library, by telling a story of his late grandfather-in-law who took issue with today’s youth, feeling things just weren’t quite the same as they were when he was growing up. “This program is what allowed me to go to that weekend and combat all those negative opinions,” Gorman said of an annual trip he took with his in-laws. Gorman added when his grandfather-in-law passed away, he was distraught at the idea that he died with negative opinions of the modern world. After Gorman heard his friends sharing similar opinions, he found an opportunity to educate them, and says he plans to continue to do so every time he sees them. One by one, 19 teachers called up the student nominees to present them with a certificate and a gift for their kind acts. A teary Deb Knisely, the high school band director, gave thanks to three students, Matthew Peszka, Joshua Raleigh and Ryan Brown, who were particularly helpful throughout the season to both the CHS band and competing bands. Life skills teacher Dan Rella commended Shaun Davilla for always making an effort to start conversations with the life skills students and make them feel included. Literature teacher Laurie Hyland spoke of how touched she was when Callie Gallagher bought her a pair of socks because they reminded Gallagher of a sweater Hyland often wears. 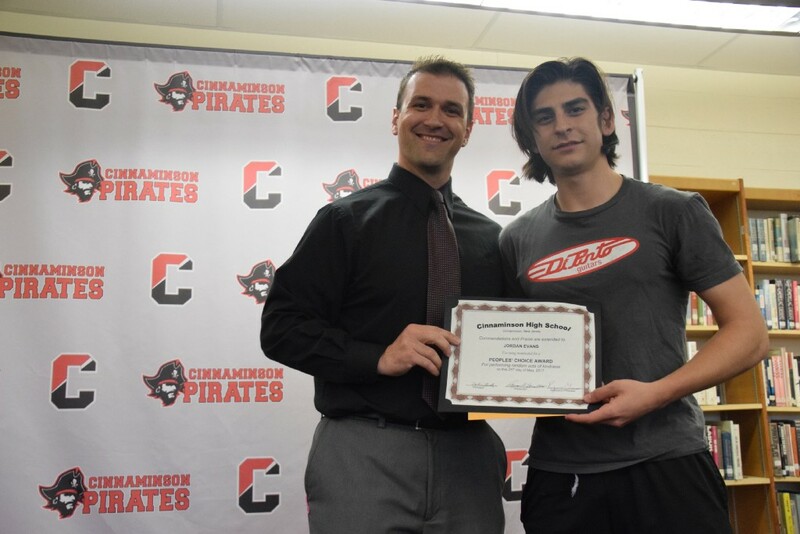 CHS math teacher Ray Bonnette presents Jordan Evans with a People’s Choice Award. Other students were recognized for taking up a collection among themselves to purchase gifts to bring a fellow student who couldn’t attend a field trip, turning in found money, giving up evenings and weekends to work on school projects, volunteering to shovel snow for senior citizens, inviting a new student to sit with them at lunch and much more. Many laughed, some cried, and all gave a round of applause to the student nominees. Superintendent Salvatore Illuzzi thanked the staff for their participation in the process, as well as the parents for a job well done in raising the students. Principal Darlene Llewellyn also felt the parents were deserving of thanks. CHS English teacher Sean Wilson presents Spencer Perry (left), Jennifer Failoa and Kathleen Gaffney with People’s Choice Awards.